NOTE: The archives of code mentioned further down on this page are several years old and pretty crusty, so I removed the links. This page is mainly just a historical curiosity now, except that the system is actually still in use in actual libraries. Etaoin Shrdlu is my name for the work I have done on an open source library automation system. It's actually more than just a library tool, as it includes tools for all kinds of community related activities and fun stuff. I've imagined that if the code were even re-written as client-server that the client would by Etaoin and the server code would be called Shrdlu. If you're curious about the word origin, look at Etaoin Shrdlu. I originally found the term in a dictionary, and have kept it in my supply of interesting trivia. I continued my work on the ILS system in a new non-profit with the director of TRF. We continued to work on the system and make a gazillion improved and refined concepts in this code base. For more information on this, please start with the Learning Access Institute's website, Click Here. 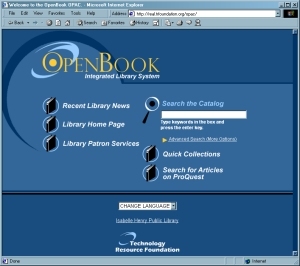 OpenBook was primarily my work but included some code by other programmers working with the Technology Resource Foundation as it became the most complete project we had toward the end. 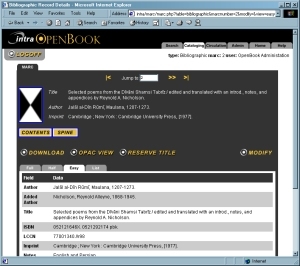 The TRF no longer exists and future OpenBook code will not be released, but these represent opensource versions of the code. This file includes some useful installation documentation, and my TODO lists. Koha West was the original project, a port of the Koha code from perl to PHP adding localization and support for MARC format records. While looking to add MARC support, I made the decision to make some fundamental changes that unfortunately meant becoming incompatible with the original project. This is code contributed to the opensource project. This was the last snapshot of my code that was still compatible with the Koha base. 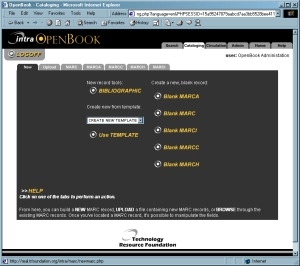 It is a php OPAC which includes localization, advanced boolean searching and other new features. I specifically packed this up so that I could provide the code to the original project.